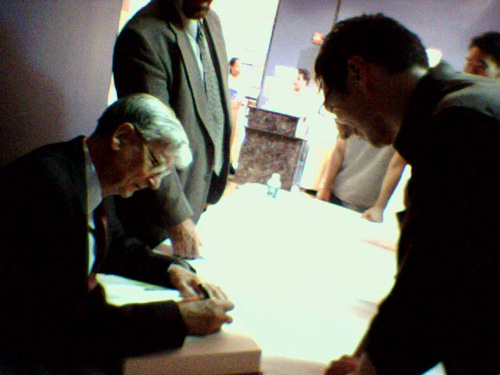 Book signing by E. O. Wilson at the AMNH. The smiling fellow to the right is yours truly. Back in June 14th, 2006, Edward O. Wilson delivered a public talk at the American Museum of Natural History in New York (the transcript of which can be read here) on the occasion of his then recently published anthology Nature Revealed: Selected Writings, 1949-2006. I wasn’t going to miss the event, and went to the public section of the museum down from the Ivory Tower research floor of the Division of Invertebrate Zoology. 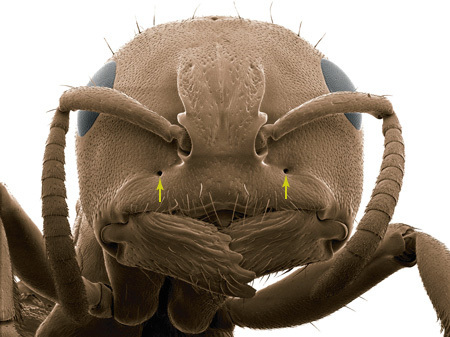 The head of an ant in frontal view has a couple of holes usually located in the area between the mouth and the place where the antennae are inserted. These holes look intriguing from the outside– Are they part of a sensing organ? Do they secrete a special chemical signal or defense substance through them? Are they use for breeding? The answer is more mundane than that. As I mentioned in an earlier post, most of what one sees in the outer surface of the arthropod’s exoskeleton does not have an external function, but is rather a symptom of the inside working in these wonderful machines. 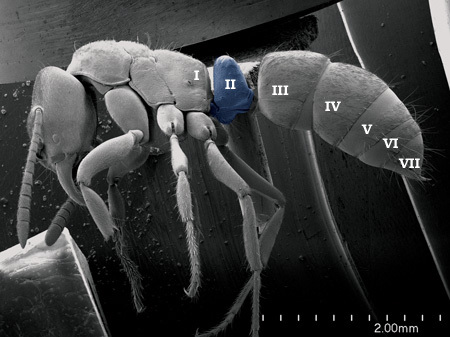 These particular holes mark the places where the cuticle invaginates to form the internal skeleton of the insect cranium known as the tentorium. The external holes produced by these invaginations are thus termed the tentorial pits. Q. DO YOU CALL AN EXTERMINATOR WHEN ANTS INFEST YOUR KITCHEN? Read the complete interview at the New York Time’s website here. 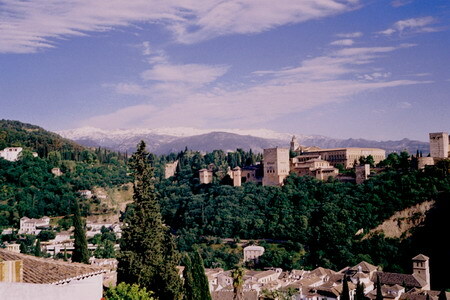 I recently traveled to Andalusia, in the southern part of the Iberian Peninsula, to meet fellow myrmecologists Christian Peeters, from the Université Pierre et Marie Curie, and Alberto Tinaut, from Universidad de Granada. The reason for my trip was that I am fortunately enough to have been invited to collaborate in one of their ongoing projects studying the native ant species Monomorium algiricum. We set out to collect some colonies of this species as well as some others in the genus. Alessandro Minelli 2003. The Development of Animal Form: Ontogeny, Morphology, and Evolution. Cambridge University Press. Cambridge. Phylogeny reconstruction, science in hindsight.